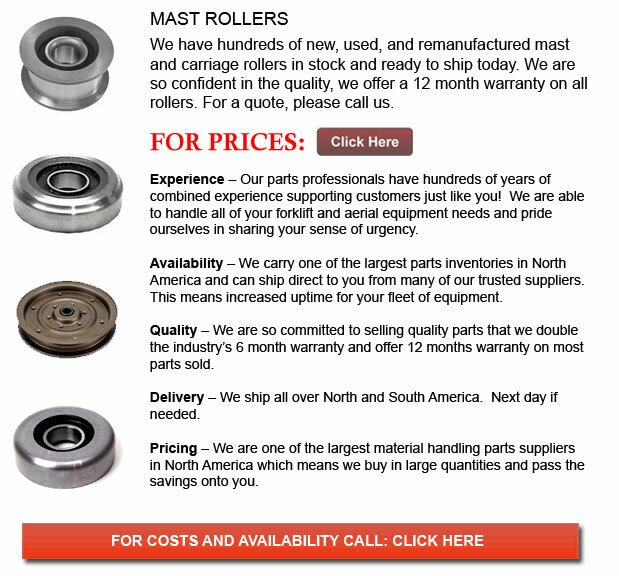 Mast Rollers for Forklift - The mast of the forklift is an integral component of the lift truck's frame. These lift truck vehicles are huge industrial equipment that help companies lift a transport materials and merchandise. The vertical construction responsible for lowering or raising a load is referred to as the mast. A lift truck mast consists of interlocking rails which give lateral steadiness. These rails are guided by bushings or rollers. Using metallic plates to help move materials, the masts are driven by hydraulic mechanisms. Hydraulics is the transmission of power which utilizes pressurized fluid, normally oil. Hydraulic cylinders that link directly to the forklift motor are responsible for driving the mast, causing it to tilt, lower or lift a load. The pressurized oil drives the cylinder piston to move in a linear motion, or in strokes. The mast is normally worked by way of a handle within the cab or located in the area of the lift truck that houses the forklift control parts and the worker. A swing mast is a lift truck mast which could turn 90 degrees in one direction. The design allows the swing mast to function efficiently in tight aisles.